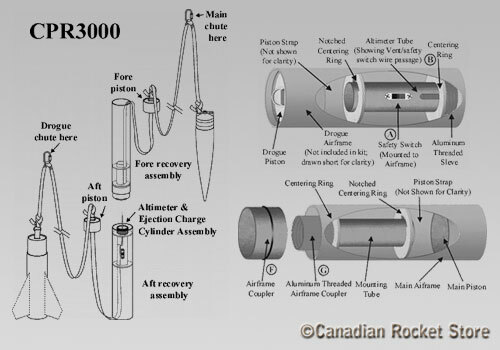 CPR3000 Adapter for Stratologger Complete CPR3000 RetroFit kit for 2.2" (54 mm) diameter airframes. CPR 3000 is the most complete Close Proximity Recovery System ever! No need to purchase separate ejection systems, external safety switch, or drogue chute! Also includes a 16 page, fully illustrated, comprehensive assembly and user manual. These systems are perfect for retro-fitting into your existing rockets or for incorporating into your new designs. Complete Threaded Airframe Coupler assembly made from 6061 aluminum with a blue anodized finish. All mounting hardware for the PML Co-Pilot or Transolve P6 altimeter. (can be modified for other altimeters). One set of fore and aft altimeter mount sealing O-rings provided; see CPR3K-OR-PK below for more information. Drogue streamer with tubular nylon shock cord. External safety switch and lead wires. 16-page fully illustrated comprehensive assembly and user manual. * Altimeter, epoxy, ejection powder, and additional airframes (if required) not included. O-rings for 2 flights are provided. (PML recommends each fore and aft altimeter assembly O-ring only be used for two flights, then be replaced). Click here to see how to modify many PML 2.1 through 3.9" diameter kits for CPR.